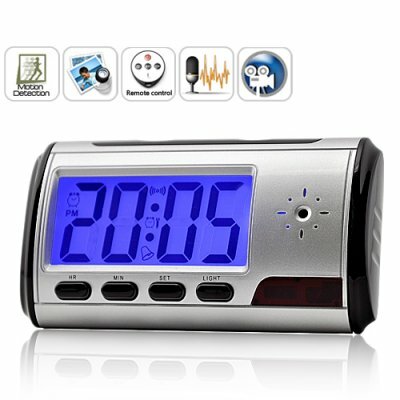 Successfully Added Digital Camera Clock with Remote Control and Motion Detection to your Shopping Cart. This brand new Digital Camera Clock looks and works just like a normal desk clock, but hidden inside is a virtually undetectable pinhole video lens that lets you covertly take pictures and record video and audio! devices are all the rage right now and this Digital Camera Clock shows you why! With its simple and inconspicuous design, this hidden surveillance gadget has so many uses and possibilities: Think someone is stealing from you? Afraid your loved one is cheating on you? Think your kid is doing something bad in his room? Well now you can finally find out the truth with this Digital Camera Clock! How? Remote Video and Audio Recording: This Digital Camera Clock records beautiful 640x480 videos directly to a Micro SD card (free 4GB micro SD card included!) at 30FPs for smooth motion capture - and it even records audio! Even better, everything is controlled by a remote control, so you don't have to touch the device at all! Motion Detection Video Recording: This Digital Camera Clock can be set to record video only when an object passes in front of the lens. That means you can leave this surveillance/ gadget in front of your desk and see who has been going through your things! Remote Picture Snapshots: More one-button goodness from this Digital Camera Clock - now, you can take instant picture snapshots! It doesn't get easier when you need photographic evidence or need to secretly on someone! This Digital Camera Clock is great for home, office, and anywhere else you want to use it! If you are a reseller, this is a good chance to sell a unique device before anyone else. Place your orders now and we will express ship your order by tomorrow! And don't forget, this Digital Camera Clock is backed by our famous 12 month guarantee and is in stock now. Available only from the leaders in wholesale electronics, Chinavasion! Free 4GB micro SD card included! How do I access the files on this Digital Camera Clock? Install the time stamp software on the CD and follow the instructions. Wonderful product, and speedy delivery (4 days from China to California!). fast delivery, first class support, sure to buy again by chinavision. on 2010-11-25 17:42:31 This is a master piece of all secrets behind closed door. Sin duda un excelente dispositivo de grabación; la función motion detect funciona de manera excepcional y la calidad del video supera las expectativas; el tiempo de entrega super rápido; solo 4 dias hasta México.